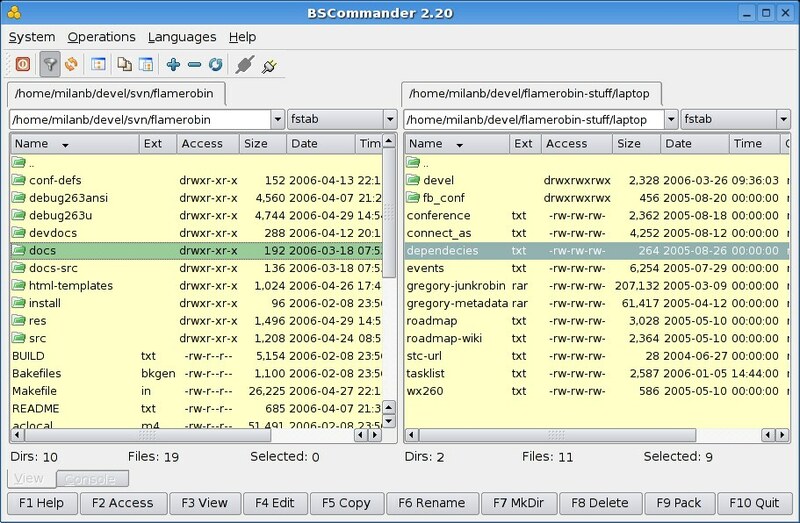 Well, I just tested BSCommander 2.20 today. Install was almost too easy, as Slackware package is available from slacky.it. It has many useful options I couldn’t find in other similar programs and idea with tabs is excellent and done properly. It uses Qt library and works really fast (which can’t be said for Krusader and Konqueror and many others). Keyboard shortcuts are setup very good (although not configurable). One thing I can’t find is how to make the opposite panel display the same directory as the current one (can be done with Meta+o in mc). Many times I just need to move/copy some file few directories up or down the hierarchy, so this one is crucial for me. Another useful option that is lacking is ability to open terminal in current directory (or at least execute command there). Most other programs of this kind have that feature. It would also be useful with FTP to be able to send some command to the server (for example, when I connect to ftp on Windows server, I need to type “cd d:” to access second partition). One of the things that could be fixed is that it doesn’t remember the position (selected directory) during FTP session. It works properly on local disk though. Also, it is not possible to copy directories via FTP, which doesn’t really make FTP support useful.